Rear wings are extensively utilized in high performance Formula 1 cars to considerably increase the down force and keep the car stable on the road surface at high accelerating speeds. 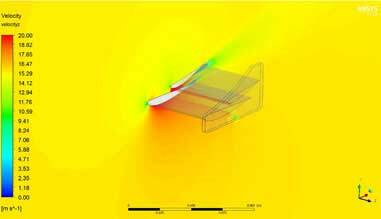 However, the placement of the wings and its airfoil geometry is equally important to achieve efficient performance, as improperly designed rear wings may lead to vortex formation, causing the vehicle to become unstable and difficult to steer. 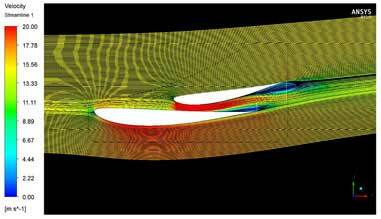 Hi-Tech assisted a client from Europe in identifying the lift and drag forces over the rear wing design through computational fluid dynamics. 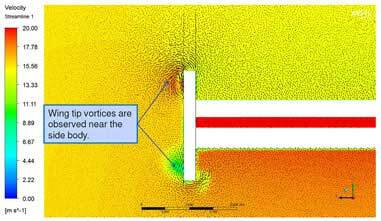 Applying the boundary conditions with suitable turbulence model, the velocity and pressure distribution over the wings were simulated. The results showed the formation of strong wing tip vortices near the side body. The drag, lift and lateral forces were calculated through post-processing as requested by the client. Hi-Tech CAE is a division of Hi-Tech Outsourcing Services, a pioneer engineering outsourcing company, providing expert Computer Aided Engineering – CAE consulting services for engineering / product design analysis. The primary services include Computational Fluid Dynamics (CFD), Finite Element Analysis (FEA), product design optimization and value engineering services for Automotive, Building / Construction, Process industry, Power Generation, Manufacturing & Heavy Engineering domains.